This voluntary medical project helps treat patients at various health clinics in Coachabamba. These clinics are open to all people, regardless of social standing or wealth. They lack human and financial resources and need qualified doctors to help with the workload. 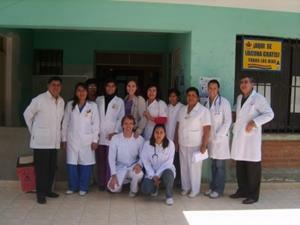 How can volunteer doctors help in Bolivia? Diagnosing medical conditions and planning appropriate treatment. Helping staff look at ways of improving their quality of service. Holding seminars and workshops at a local university. Running training clinics for Projects Abroad volunteers working with other hospitals (optional). You will first be assigned to work with a supervisor who will help you as you adjust to life in Bolivia. Once you have settled in you will be able to work independently. You can help at more than one institution if you want to. Your hours of work will be agreed when you arrive but most volunteers work around 6 hours a day, Monday to Friday. You will gain experience of working with qualified professionals in a challenging environment. You will see treatments for diseases and injuries that are common to Bolivia but rare in your own country. You will also improve your Spanish language and communication skills through regular use. If you are interested in this project but don't have the relevant experience, then please read about our regular Medicine project in Bolivia.